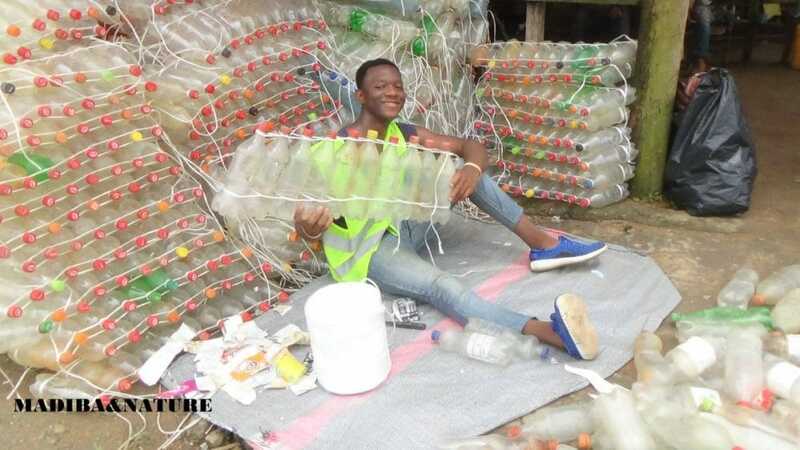 The charismatic Ismaël Essome Ebone is the young entrepreneur behind Madiba & Nature, the Cameroonian nonprofit which uses plastic waste to build ecological canoes. 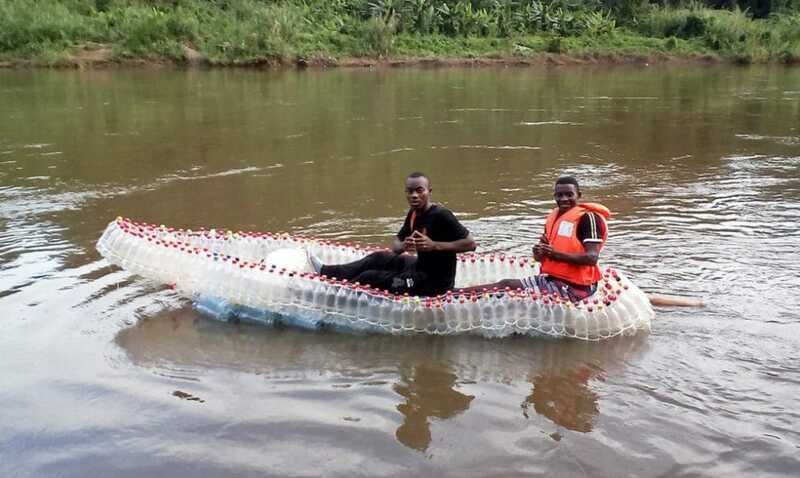 The idea of ​​designing a boat made from recovered and recycled plastic bottles came to him 2011, when the student had to take shelter from heavy rain and observed plastic bottles flowing past. It only took a few minutes of downpour before his neighbourhood was flooded. Fishermen laughed when he first ventured out in his ‘ecoboat’, heckling him from the shore. “Where are you going with your toy? It will tear itself in the water!” But he braved the strong waves and currents without a lifejacket. And that shut them up. A wooden boat would have tipped, but not Ismaël’s raft of bottles. 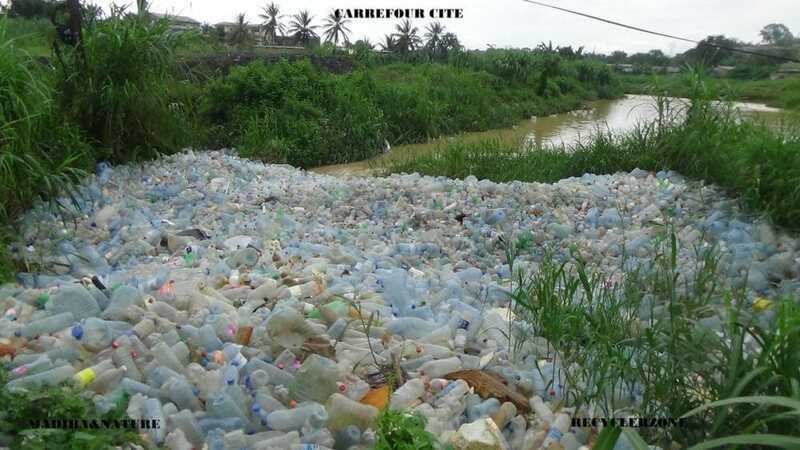 Ismaël’s actions are based on the circular economy, with the aim of reusing and recycling all the waste that pollutes the towns and cities in Cameroon, in order to ensure the conservation of nature and its biodiversity. 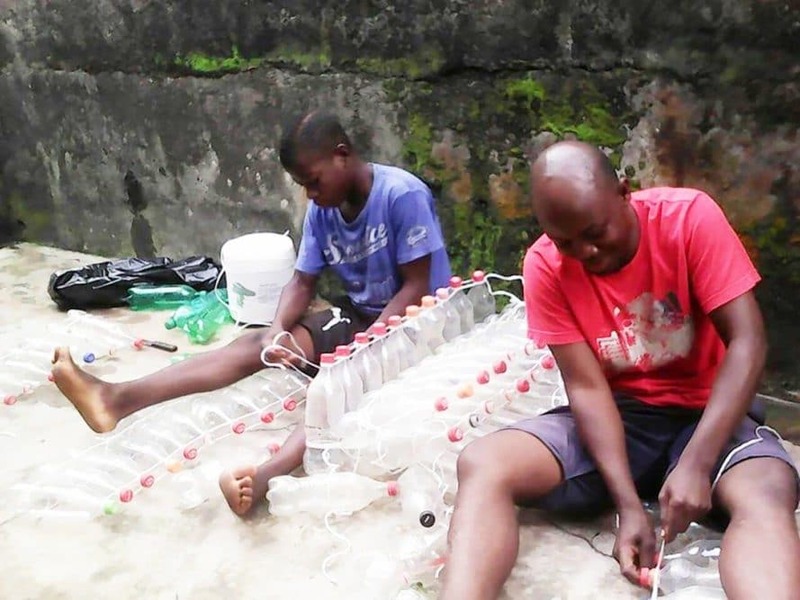 He started by gathering 1,000 plastic bottles collected in the drains of Douala, the economic capital of Cameroon, and then assembled them into blocks of ten connected by a wire, which makes them move like a caterpillar. To make an entire boat takes around one week. Since April 2016, Madiba & Nature has grown team into a team of five, assisted by volunteers and students. There’s a great need for strong and seaworthy fishing boats in the Kibri region, Ismaël’s area, but he isn’t stoping there. The 27-year-old also makes beds, furniture and tourist holiday homes from bottles. However, the dream is to create a system that enables the vulnerable people in Africa to make use of waste products to build homes. Madiba & Nature also plans to develop other kinds of tourism based on ecological practices that help contribute to the diversification of these people’s sources of income, while fighting pollution and stopping flooding from plastic bottles that clog up the local waterways with devastating effects. AtlasAction: Madiba & Nature wants to offer hope and develop ecotourism for the Londji fishing community village. Contact Ismaël to donate through the Madiba & Nature website. Madiba & Nature is featured in: An African AtlasChart: 4 magical citizen initiatives. Tags: Africa, Awareness raising, Cameroon, Circular economy, Conservation, Construction, Environment, Hygiene, Plastic waste, Poverty, Recycling, Sanitation, Social inequality, Waste.